Patrick G. Eddington was a military imagery analyst at the CIA’s National Photographic Interpretation Center for almost nine years. 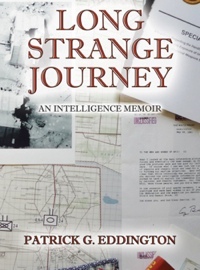 He received numerous accolades for his analytical work, including letters of commendation from the Joint Special Operations Command, the Joint Warfare Analysis Center and the CIA’s Office of Military Affairs. During his tenure at CIA, Eddington worked a wide range of intelligence issues. His analytical assignments included monitoring the break-up of the former Soviet Union; providing military assessments to policy makers on Iraqi and Iranian conventional forces; and coordinating the CIA’s military targeting support to NATO during Operation Deliberate Force in Bosnia in 1995. Eddington received his undergraduate degree in International Affairs from Southwest Missouri State University in 1985. While at the CIA, Eddington took a one-year sabbatical to attend Georgetown University, earning a master’s degree in National Security Studies. Eddington spent eleven years in the U.S. Army Reserve and the National Guard in both enlisted and commissioned service. Eddington’s opinion pieces have appeared in a number of publications, including the Washington Post, Los Angeles Times, Washington Times, Fort Worth Star-Telegram, and the Army Times, among others. Eddington has been a frequent commentator on national security issues for the Fox News Channel, MSNBC, SKYNews, CNN, and other domestic and international television networks. His first book, Gassed in the Gulf, was featured on the September 20, 1997 edition of CSPAN’s “About Books” program. He and his wife Robin live in Alexandria, Virginia with their three Border Collies/mixes, Jack, Coco, and Jib.